The Christmas spirit is officially in the air and I just couldn’t be more excited! 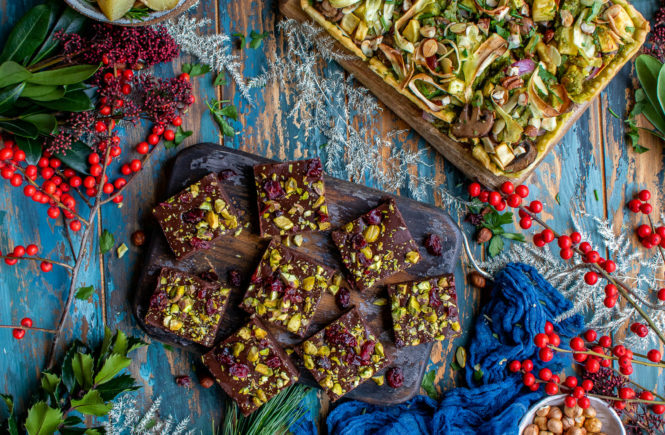 This year I will spending Christmas with my family in Italy and I cannot wait to cook a super indulgent plant-based feast for the people I love. For me there is nothing better than gather around the kitchen, listen to cheesy Christmas songs and cook delicious food. 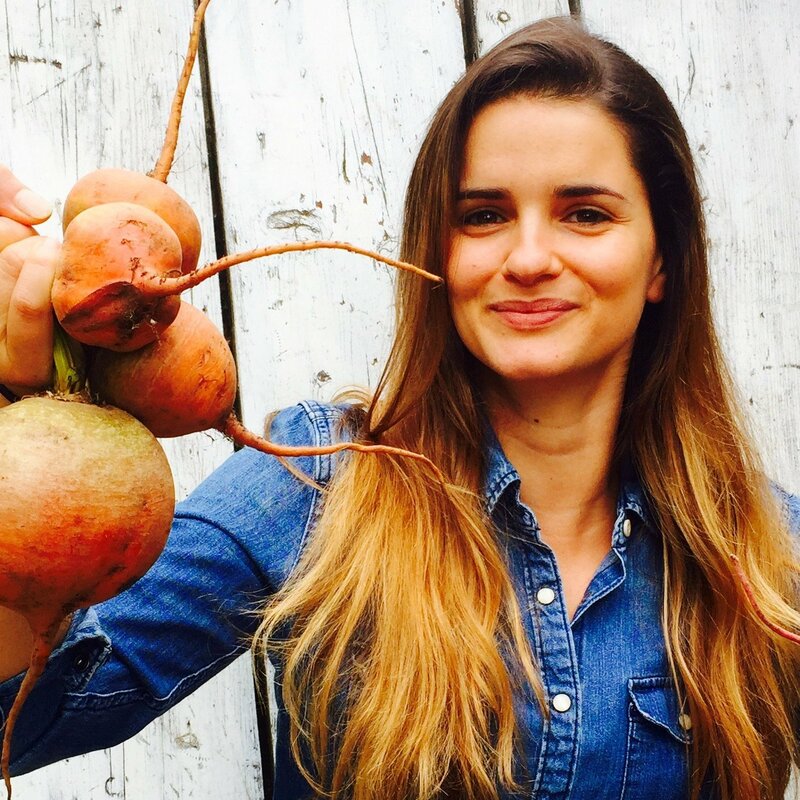 Thanks to Tesco I found some seriously incredible and straightforward recipes which I will definitely be making during the festivities! 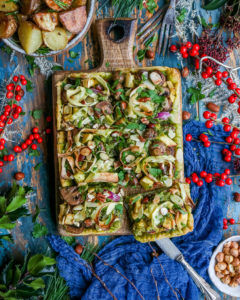 One of my favourite has to be this Mushroom Nut Roast Tart with pesto, it’s so easy to make, packed full of flavour and a great alternative to a more traditional nut roast. 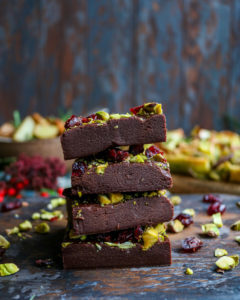 Followed by this ridiculously indulgent Chocolate Fudge which I topped with some chopped pistachios and cranberries to make it a bit more festive! 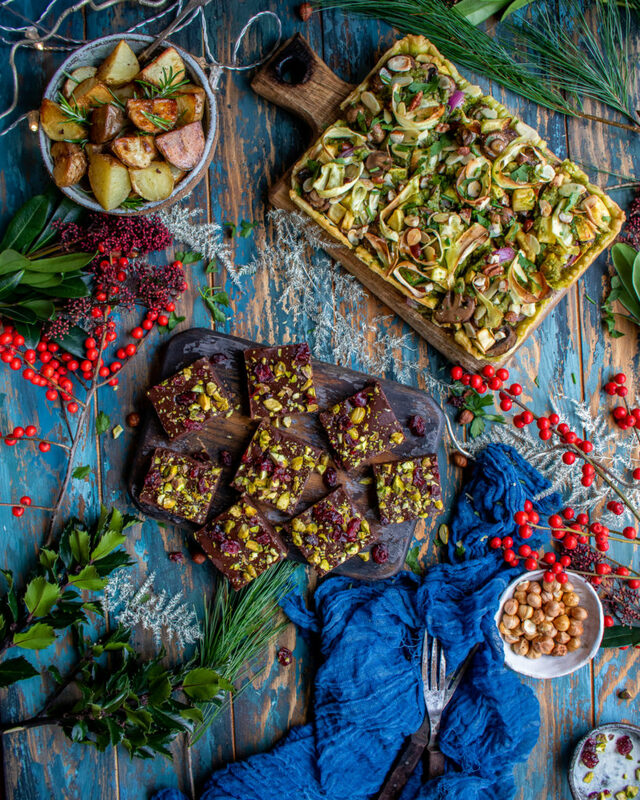 The recipe for the Mushroom Nut Roast Tart with pesto is down below but click here for the full recipe for the Chocolate Fudge. 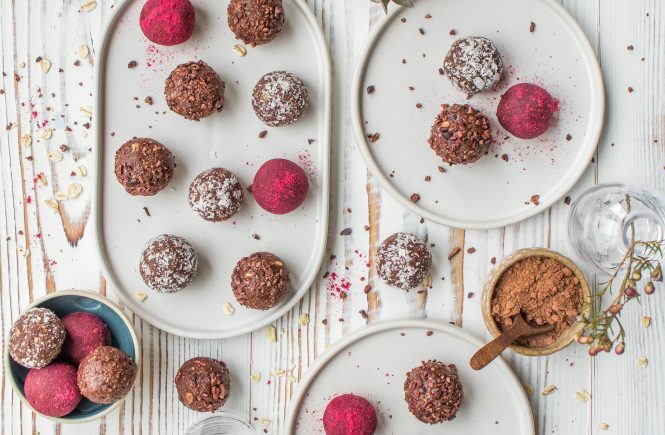 On the Tesco website you ca also find so many more decadent and delicious planet based recipes which I am guarantee you will inspire you to cook a unforgettable Christmas feast! 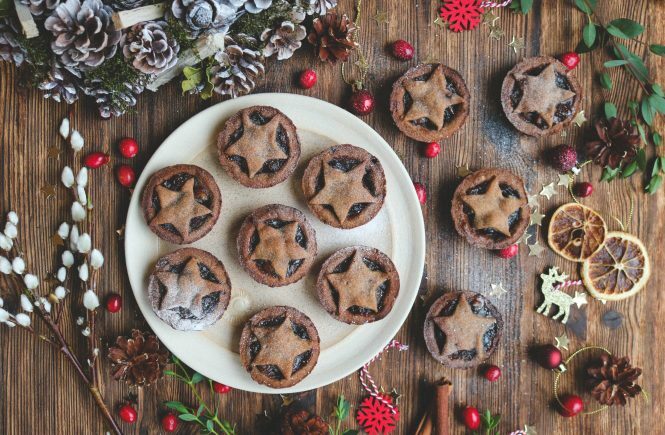 Inspired by a classic nut roast this homemade tart is the ideal easy vegan Christmas Dinner. I absolutely love the meaty mushrooms combined with the sharp red onion, parsnip ribbons and crunchy nut and seeds. 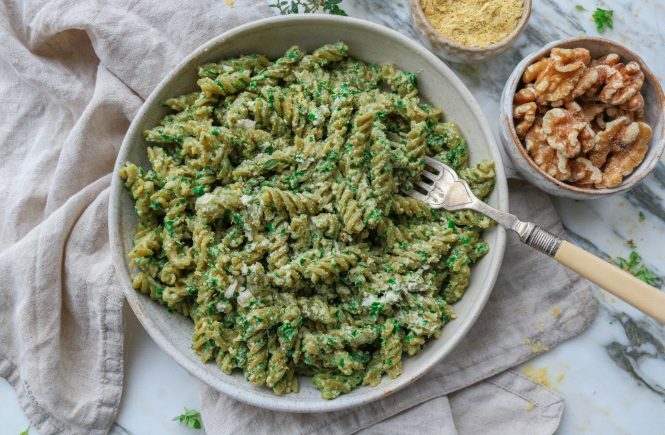 The pesto goes so well with all the earthy flavour and adds a lovely fresh note to the dish. The pastry can be also made in advance, saving you time on the big day! To make the pastry, use a cutlery knife to mix the our, suet, seeds and a pinch of salt in a large bowl. Add 125ml cold water and, still using the knife, mix to bring the pastry together into a ball. On a lightly floured surface, roll the pastry into a rectangle to line a 30 x 20cm baking tin; trim to fit, discarding any trimmings. Chill in the fridge for 30 mins. Preheat the oven to gas 6, 200°C, fan 180°C. Line the pastry with nonstick baking paper; fill with baking beans. Bake on the top shelf for 25 mins. Remove the beans and paper; set aside to cool. Peel 50g parsnips into ribbons and set aside. Chop the remaining parsnips and put in a large roasting tin with the onion. Drizzle with the maple syrup and 1 tbsp olive oil; season and toss to coat. Roast for 30 mins, stirring halfway, until soft and lightly golden. Set aside to cool. Heat 1 tbsp olive oil in a large, deep frying pan over a high heat. Add the mushrooms; season and cook, stirring frequently, for 5 mins until soft and well coloured. You may need to do this in batches. Transfer to a bowl to cool. For the pesto, toast the nuts in a dry pan over a medium heat for 1-2 mins, tossing until lightly golden. Set half the nuts aside and tip the rest into a food processor; pulse until fairly fine. Add the chives, parsley, basil, garlic and 2 tbsp olive oil; season. Blitz until well combined. To assemble, spread half the pesto over the base of the pastry. Strain and discard the liquid from the mushrooms, then arrange over the pesto, followed by the roasted parsnips and onion. Add 1 tbsp each olive oil and water to the remaining pesto, then spoon it over the tart. Roughly chop and scatter over half the nuts. Toss the parsnip ribbons with 1 tsp olive oil and arrange them over the top, finishing with nuts and 2-3 tsp pesto. Bake on the middle shelf for 20-25 mins until the parsnip ribbons are lightly golden and the tart is heated through. Slice into squares and drizzle with the reserved pesto, if you like. Get ahead: Cook the pastry the day before. Keep in the tin, covered with clingfilm, at room temperature.